Earlier this month, Howard Baldwin, the former owner of the Hartford Whalers, had launched a campaign in an attempt to bring an NHL team back to Connecticut. The campaign was intended to increase fan interest regarding the prospects bringing a team back to the city, and convince NHL officials that Hartford does offer the league a viable market. Baldwin may have a difficult time convincing the latter group, but he does appear to have the support of one notable fan. 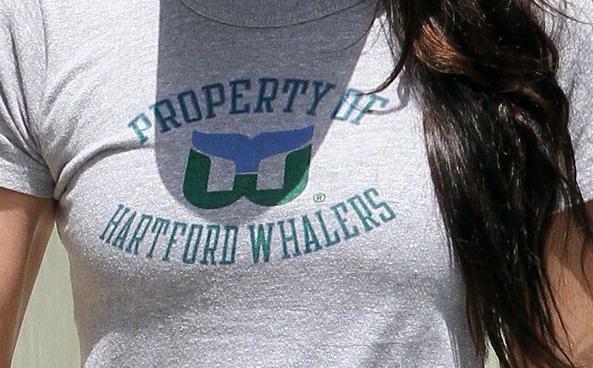 Megan Fox was spotted wearing a “Property of the Hartford Whalers” t-shirt as she left her gym in Los Angeles on Saturday. If Baldwin can successfully bring back the Whalers, it looks as though they will already have a face for the franchise. And what a face it is! Now if only he could get Megan to do some of the convincing for him. After all, how could the NHL say no to a body like that?